Are you in the business of deploying microservices? Read on to learn more about some of the hardest things about working with microservices. Of the reasons that we attempt a microservices architecture, chief among them is allowing your teams to be able to work on different parts of the system at different speeds with minimal impact across teams. We want teams to be autonomous, capable of making decisions about how to best implement and operate their services, and free to make changes as quickly as the business may desire. If we have our teams organized to do this, then the reflection in our systems architecture will begin to evolve into something that looks like microservices. To gain this autonomy, we need to shed our dependencies, but that’s a lot easier said than done. I’ve seen folks refer to this idea in part, trivially, as “each microservice should own and control its own database and no two services should share a database.” The idea is sound: don’t share a single database across services because then you run into conflicts like competing read/write patterns, data-model conflicts, coordination challenges, etc. However, a single database does afford us a lot of safeties and conveniences: ACID transactions, a single place to look, well-understood (kinda? ), one place to manage, etc. When building microservices, how do we reconcile these safeties with splitting up our database into multiple smaller databases? What is the domain? What is the reality? This seems to be ignored at a lot of places, but there's a huge difference between how the internet companies practice microservices and how a traditional enterprise may (or may fail because of neglecting this) implement microservices. Before we can build a microservice and reason about the data it uses (produces, consumes, etc. ), we need to have a reasonably good, crisp understanding about what that data is representing. 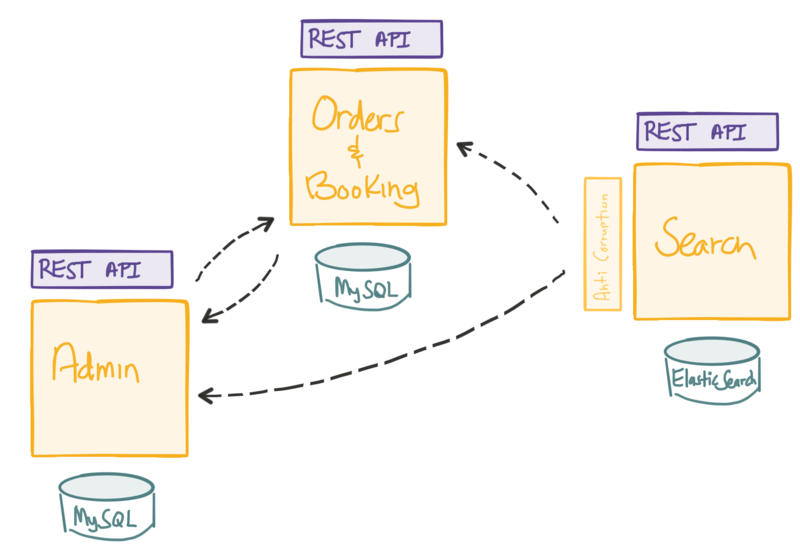 For example, before we can store information into a database about bookings for our TicketMonster and its migration to microservices, we need to understand what a booking is. Just like in your domain, you may need to understand what an account, employee, or a claim are. To do that, we need to dig into what “it” is in reality. For example, what is a book? Try to stop and think about that, as it’s a fairly simple example. Try to think about what a book is. How would we express this in a data model? Is a book something with pages? Is a newspaper a book (it has pages)? So, maybe a book has a hard cover? Or, is it something that’s not released or published every day? If I write a book (which I did – Microservices for Java Developers), the publisher may have an entry for me with a single row representing my book. However, a bookstore may have five of my books. Is each one a book, or are they copies? How would we represent this? What if a book is so long that it has to be broken down into volumes, is each volume a book, or all of them combined? What if many small compositions are combined together? Is the combination the book, or each individual one? Basically, I can publish a book and have many copies of it in a bookstore, each one with multiple volumes. So, what is a book? The reality is that there is no reality. There is no objective definition of a book with respect to reality, so to answer any question like that, we have to know who’s asking the question and what the context is. Context is king. We as humans can quickly (and even unconsciously) resolve the ambiguity of this understanding because we have a context in our heads, in the environment, and in the question. A computer doesn’t. We need to make this context explicit when we build our software and model our data. Using a book is to illustrate this is simplistic. Your domain (an enterprise) with its accounts, customers, bookings, claims, etc., is going to be far more complicated and far more conflicting and ambiguous. We need boundaries. Where do we draw the boundaries? The work in the Domain-Driven Design community helps us deal with this complexity in the domain. We draw a bounded context around Entities, Value Objects, and Aggregates that model our domain. Stated another way, we build and refine a model that represents our domain and that model is contained within a boundary that defines our context. This is explicit. 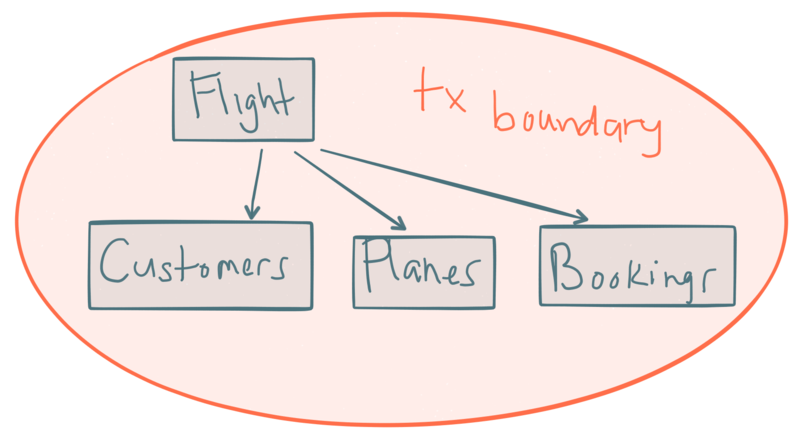 These boundaries end up being our microservices, or the components within the boundaries end up being microservices, or both. Either way, microservices is about boundaries and so is DDD. Our data model (how we wish to represent concepts in a physical data store; note the explicit difference here) is driven by our domain model, not the other way around. When we have this boundary, we know and can make assertions about what is correct in our model and what is incorrect. These boundaries also imply a certain level of autonomy. Bounded context “A” may have a different understanding of what a “book” is than bounded context “B” (i.e., maybe bounded context “A” is a search service that searches for titles where a single title is a “book”; maybe bounded context “B” is a checkout service that processes a transaction based on how many books (titles+copies) you’re buying, etc). The journey to microservices is just that: a journey. It will be different for each company. There are no hard and fast rules, only tradeoffs. Copying what works for one company just because it appears to work at this one instant is an attempt to skip the process and journey and will not work. And the point to make here is that your enterprise is not Netflix. In fact, I’d argue that for however complex the domain is at Netflix, it’s not as complicated as it is at your legacy enterprise. Searching for and showing movies, posting tweets, updating a LinkedIn profile, etc., are all a lot simpler than your insurance claims processing systems. These internet companies went to microservices because of speed to market, sheer volume, and scale (posting a tweet to Twitter is simple; posting tweets and displaying tweet streams for 500 million users is incredibly complex). Enterprises today are going to have to confront complexity in both the domain and scale. Accept the fact that this is a journey that balances domain, scale, and organizational changes. It will be different for each organization. Don’t ignore it. Back to the story. We need something like domain-driven design to help us understand the models that we’ll use to implement our systems and draw boundaries around these models within a context. We accept that a customer, account, booking, etc. may mean different things to different bounded contexts. At the end of the day, we may end up with these related concepts distributed around our architecture, but we need some way to reconcile changes across these different models when changes happen. We need to account for this, but first, we need to identify our transactional boundaries. Unfortunately, we as developers still seem to approach building distributed systems all wrong: we still look through the lens of one, single, relational, ACID, database. We also ignore the perils of an asynchronous, unreliable networks. To wit, we do things like write fancy frameworks that keep us from having to know anything about the network (including RPC frameworks, database abstractions that also ignore the network) and try to implement everything with point-to-point synchronous invocations (REST, SOAP, other CORBA-like object serialization RPC libraries, etc.). We build systems without regard to authority vs. autonomy and end up trying to solve the distributed data problem with things like two-phase commit across lots of independent services. Or, do we ignore these concerns all together? This mindset leads to building very brittle systems that don’t scale. It doesn’t matter if you call it SOA, microservices, mini-services, or whatever. What do I mean by transactional boundaries? I mean the smallest unit of atomicity that you need with respect to the business invariants. Whether you use a database’s ACID properties to implement the atomicity or a two-phase commit, etc., doesn’t really matter. The point is that we want to make these transactional boundaries as small as possible (ideally a single transaction on a single object: Vernon Vaughn has a series of essays describing this approach with DDD aggregates) so we can scale. When we build our domain model using DDD terminology, we identify entities, value objects, and aggregates. Aggregates in this context are objects that encapsulate other entities and value objects and that are responsible for enforcing invariants (there can be multiple aggregates within a bounded context). We’d probably have three bounded contexts here: search, booking, and ticketing (we’d likely have lots more like payments, loyalty, standby, upgrades, etc., but we’ll keep it narrowed to these three). Search is responsible for showing flights for specific routes and itineraries for a given time frame (range of days, times, etc). Booking will be responsible for teeing up the booking process with customer information (name, address, frequent flyer number, etc. ), seat preferences, and payment information. Ticketing would be responsible for actually settling the reservations with the airline and issuing a ticket. Within each bounded context, we want to identify transactional boundaries where we can enforce constraints and invariants. We will not consider atomic transactions across bounded contexts (we’ll discuss this in the next section). How would we model this considering that we want small transaction boundaries (this is a very simplified version of booking a flight, BTW)? Maybe a flight aggregate that encapsulates values like time, date, route and entities like customers, planes, and bookings? This seems to make sense; a flight has a plane, seats, customers, and bookings. The flight aggregate is responsible for keeping track of planes, seats, etc. for the purposes of creating bookings. This may make some sense from a data model standpoint inside of a database (nice relational model with constraints and foreign keys, etc), or make a nice object model (inheritance and composition) in our source code, but let’s look at what happens. Are there really invariants across all bookings, planes, flights, etc. just to create a booking? That is, if we add a new plane to the flight aggregate, should we really include customers and bookings in that transaction? Probably not. What we have here is an aggregate built with compositional and data model conveniences in mind. However, the transactional boundaries are too big. If we have lots of changes to flights, seats, bookings, etc., we’ll have a lot of transactional conflicts (whether using optimistic or pessimistic locking won’t matter). And that obviously doesn’t scale (never mind failing orders all the time just because a flight schedule is changing being a terrible customer experience). What if we broke the transactional boundaries a little smaller? Maybe booking, seat availability, and flights are their own independent aggregates. A booking encapsulates customer information, preferences and maybe payment information. The seat availability aggregate encapsulates planes and plane configurations. Flights aggregate is made up of schedules, routes, etc., but we can proceed with creating bookings without impacting transactions on flight schedules, planes, and seat availability. From a domain perspective, we want to be able to do that. We don’t need 100% strict consistency across planes, flights, and bookings, but we do want to correctly record flight schedule changes as an admin, plane configurations as a vendor, and bookings from customers. How do we implement things like “pick a particular seat” on a flight? During the booking process, we may call into the seat availability aggregate and ask it to reserve a seat on a plane. This seat reservation would be implemented as a single transaction, for example, (hold seat 23A) and return a reservation ID. We can associate this reservation ID with the booking and submit the booking knowing the seat was at one point reserved. Each of these (reserve a seat and accept a booking) are individual transactions and can each proceed independently without any kind of two-phase commit or two-phase locking. Note that using a “reservation” here is a business requirement. We don’t do seat assignment here; we just reserve the seat. 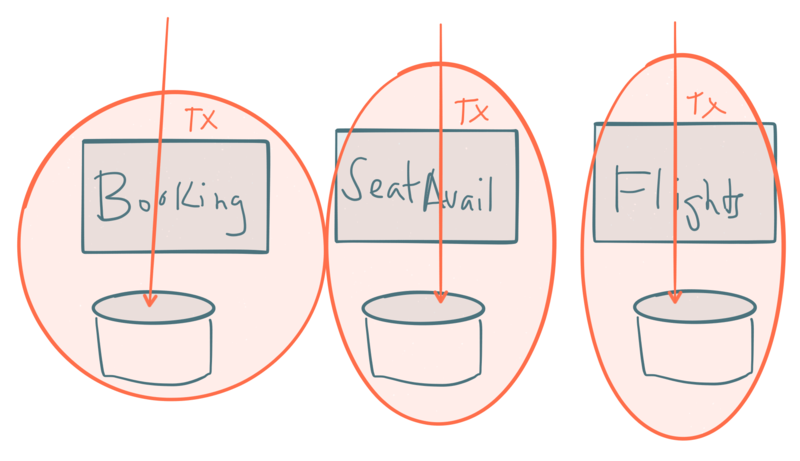 This requirement would need to be fettered out potentially through iterations of the model because the language for the use case at first may simply say “allow a customer to pick a seat.” A developer could try to infer that the requirement means “pick from the remaining seats, assign this to the customer, remove it from inventory, and don’t sell more tickets than seats.” This would be extra, unnecessary invariants that would add additional burden to our transactional model which the business doesn’t really hold as an invariant. The business is certainly okay taking bookings without complete seat assignments and even overselling the flight. We want to keep the true business invariants intact. With DDD, we may choose to model these invariants as aggregates and enforce them using single transactions for an aggregate. There may be cases where we’re updating multi-aggregates in a single transaction (across a single database or multiple databases), but those scenarios would be the exception. We still need to maintain some form of consistency between aggregates (and eventually between bounded contexts). How should we do this? One thing that we should understand: distributed systems are finicky. There are very few guarantees if any we can make about anything in a distributed system in bounded time (things will fail, things are non-deterministically slow or appear to have failed, systems have non-synchronized time boundaries, etc. ), so why try to fight it? What if we embrace this and bake it into our consistency models across our domain? What if we say “between our necessary transactional boundaries, we can live with other parts of our data and domain to be reconciled and made consistent at some later point in time”? For microservices, we value autonomy. We value being able to make changes independent of other systems (in terms of availability, protocol, format, etc.). This decoupling of time and any guarantees about anything between services in any bounded time allows us to truly achieve this sort of autonomy (this is not unique to computer systems, or any systems for that matter). So, I say, between transaction boundaries and between bounded contexts, use events to communicate consistency. Events are immutable structures that capture an interesting point in time that should be broadcast to peers. Peers will listen to the events in which they’re interested and make decisions based on that data, store that data, store some derivative of that data, update their own data based on some decision made with that data, etc., etc. Continuing the flight booking example I somehow started (instead of using my TicketMonster example…that’s what happens when I start writing! ), when a booking is stored via an ACID-style transaction, how do we end up ticketing that? That’s where the aforementioned ticketing bounded context comes in. The booking bounded context would publish an event like “NewBookingCreated” and the ticketing bounded context would consume that event and proceed to interact with the backend (potentially legacy) ticketing systems. This obviously requires some kind of integration and data transformation which is something Apache Camel would be great at. It also brings up some other questions. How do we do a write to our database and publish to a queue or messaging appliance atomically? What if we have ordering requirements or causal requirements between our events? What about one database per service? Ideally, our aggregates would use commands and domain events directly (as a first class citizen; that is, any operation is implemented as commands and any response is implemented as reacting to events) and we could more cleanly map between the events we use internally to our bounded context and those we use between contexts. We could just publish events (i.e., NewBookingCreated) to a messaging queue and then have a listener consume this from the queue and insert it idempotently into the database without having to use XA/2PC transactions instead of inserting into the database ourselves. We could insert the event into a dedicated event store that acts like both a database and a messaging publish-subscribe topic (this is probably the preferred route). Or, you can just continue to use an ACID database and stream changes to that database to a persistent, replicated log like Apache Kafka using something like Debezium and deduce the events using some kind of event processor or steam processor. Either way, the point is we want to communicate between boundaries with immutable point-in-time events. We avoid expensive, potentially impossible transaction models across boundaries. We can make changes to our system without impeding the progress of other parts of the system (timing and availability). We can decide how quickly or slowly we want to see the rest of the outside world and become eventually consistent. We can store the data in our own databases however we’d like using the technology appropriate for our service. We can make changes to our schema and databases at our leisure. We become much more scalable, fault tolerant, and flexible. You have to pay even more attention to CAP Theorem and the technologies you chose to implement your storage and queues. Since you have a delay when seeing events, you cannot make any assumptions about what other systems know (which you cannot do anyway, but it’s more pronounced in this model). It's more difficult to operationalize. I listed “paying attention to CAP, et. al” in both columns because although it places a bit more of a burden on you, it’s imperative that you do so anyway! It’s imperative that we always pay attention to the different forms of data consistency and concurrency in our distributed data systems! Relying on “our database in ACID” is no longer acceptable (especially when that ACID database most likely defaults to some weak consistency anyway; so much for your ACID properties). Another interesting concept that emerges from this approach is the ability to implement a pattern known as “command query separation responsibility” where we separate our read model and our write models into separate services. Remember, we lamented the internet companies don’t have very complex domain models. This is evident in their write models being simple (insert a tweet into a distributed log for example). However, their read models are crazy complicated because of their scale. CQRS helps separate these concerns. On the flip side, in an enterprise, the write models might be incredibly complicated while the read models may be simple flat select queries and flat DTO objects. CQRS is a powerful separation of concerns pattern to evaluate once you’ve got proper boundaries and a good way to propagate data changes between aggregates and between bounded contexts. Now you can treat your database as a current state of record, not the true record. You can introduce new applications and re-read the past events and examine their behaviors in terms of what would have happened. You can perfect audit logging for free. You can introduce new versions of your application and perform quite exhaustive testing on it by replaying the events. You can more easily reason about database versioning, upgrades, and schema changes by just replaying the events into the new database. You can migrate to completely new database technology (i.e., maybe you find you’ve outgrown your relational DB and you want to switch to a specialized database or index). When you book a flight on aa.com, delta.com, or united.com, you’re seeing some of these concepts in action. When you choose a seat, you don’t actual get assigned it, you reserve it. When you book your flight, you don’t actually have a ticket. You get an email later telling you you’ve been confirmed/ticketed. Have you ever had a plane change and be assigned a different seat for the actual flight, or been to the gate and heard them ask for volunteers to give up their seat because they oversold the flight? These are all examples of transactional boundaries, eventual consistency, compensating transactions, and even apologies at work. The moral of the story here is that data, data integration, data boundaries, enterprise usage patterns, distributed systems theory, timing, etc. are all the hard parts of microservices (since microservices is really just distributed systems!). I’m seeing too much confusion around technology (“If I use Spring Boot I’m doing microservices,” “I need to solve service discovery and load balancing in the cloud before I can do microservices,” “I must have a single database per microservice,” and so on) and useless “rules” regarding microservices. Don’t worry. Once the big vendors have come and sold you all the fancy suites of products (hmm does SOA ring a bell? ), you’ll still be left to do the hard parts listed above.